The Interstring Project is an experimental guitar ensemble with an unique sound aesthetic, committed to exploring new repertoire, as well as working collaboratively across different art forms. In addition to premiering new work, The Interstring Project explores new concert formats and seeks new ways to incorporate technology in their artistic practice. The unusual cast of five guitarists opens up for many creative possibilities, using both classical and electric guitars, as well as prepared and related string instruments. The ensemble’s unique creativity and eagerness to experiment can be seen in their close work with composers and artists, but also in the group’s own collective compositions. Through playing together for many years, the five musicians have established a distinctive dynamic to their performances – somewhere in between classical chamber music ensemble and rockband. The ensemble is a successor to Open Source Guitars, which was a student ensemble at the University of Music in Trossingen, Germany, and which was supported by the “Innovations- und Qualitätsfonds” of the Ministry of Culture of Baden-Württemberg for several years. Directed by its founder Prof. Michael Hampel and later by Prof. Dr. Barbara Lüneburg, Open Source Guitars evolved from a guitar orchestra to an experimental platform to explore the sonic possibilities of the guitar. 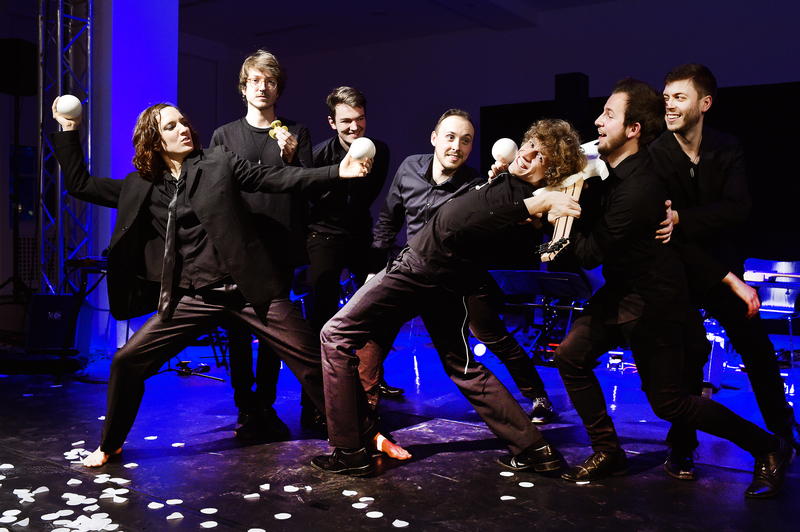 Some of their most important projects were a collectively composed score for the silent movie Nosferatu, the multimedia performance Homenaje and the collaboration with Henry Fourès and IRCAM in Paris for the production Moving Sounds / Six White Dots. The Interstring Project intend to further expand the creative vision of ensemble guitar playing and collective creation. The ensemble members are Phileas Baun, Florin Emhardt, Martin Köhler, Robert Menczel and Marius Schnurr.